The keynote speaker was Dr. Nimisha Barton of Princeton University. Charles Haas, Director of Testing and Learning Centers, left, co-presented with Dr. Matthew Mortimer. 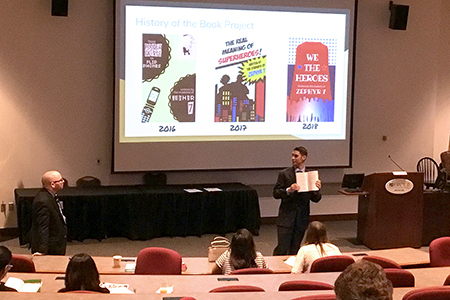 Their session, "Empowering Students and Educators Through Publication," showcased the use of 21st century technology to create a physical book of student work. 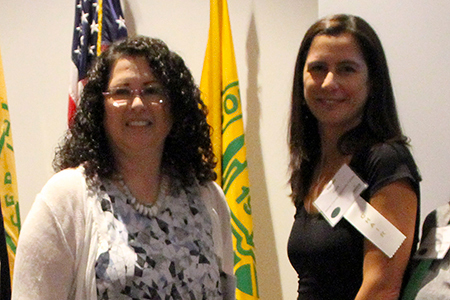 Conference co-chairs were Professor of Education Theresa Capra, right, and MercerOnline's Jill Marcus. West Windsor, N.J. -- In a day packed with speakers and discussions, Mercer County Community College (MCCC) hosted “Engaging Learners in the 21st Century,” its annual conference dedicated to teaching and learning. The event was held, on August 22 at the Conference Center at Mercer. Co-chaired by Professor of Education Theresa Capra and MercerOnline Coordinator Jill Marcus, the event drew more than 100 educators, approximately half of whom were from other community colleges and four-year institutions. The conference Steering Committee included MCCC faculty members Dr. Carol Bork (English), Elizabeth Carr (Mathematics), Ellen Genovesi (Biology), John Inzero (Business), Dr. Eirini Papafratzeskakou (Psychology) and Adena Romeo-Ratliff (Nursing), and staff members Roseann Cooper (Center for Continuing Studies) and Charles Haas (Testing and Learning Centers). Capra notes that responses like those take this annual conference to a new level, one that is likely to generate continued growth and success. Kicking off the conference was Dr. Nimisha Barton, Associate Director of Programs for Access and Inclusion at Princeton University. 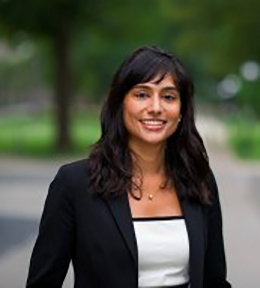 Dr. Barton developed the first four-year scholars program for first-generation, low-income students at Princeton and recently piloted a graduate program for first-gen, low-income and minority students. The undergraduate program has been featured in the Chronicle for Higher Education, Harvard Alumni magazine and 60 Minutes. Following the keynote address and a spirited question-answer-period, attendees were able to choose from myriad workshops. Among the workshops presented by MCCC faculty and staff were: “Data Driven Decision Making in Course Design“ by Dr. Jing Huang (Physics); “You Can Lead a Horse to Water” by Elizabeth Mizerek (Nursing), Lisa Dunn (Nursing), and Nichol Killian (Success Coach); “Who Is Driving This Computer Program Anyway?” by Dr. James Maccariella (Engineering); “Transformative Coaching for the 21st Century Student” by Victoria Bowman, Nichol Killian and Jehan Mohamed (Success Coaches); “Tutor Training and Reflective Practice: Notes from a New Writing Center” by Dr. Carol Bork (English), Dr. Barbara Hamilton (English) and Emanuel Medina (tutor); “Imitation: The Sincerest Form of Plagiarism” by Ellen Genovesi (Biology); “Empowering Students and Educators Through Publications: Using 21st Century Technology to create a Physical Book of Student Work” by Charles Haas (Director of Testing and Learning Centers) and Dr. Matthew Mortimer (of Harrington Middle School); “Photography in First Year Composition” by Dr. Jack Tabor (English); “Revolutionizing Your Classroom with Zoom” by Dr. Richard Porter (Mathematics); “Google Sheets for Real-time Feedback” by Ric Giantisco (Game Design); and “Addressing Fake News in the Classroom: Exercises, Examples and Information Literacy,” by Olivia Nellums (Librarian). The conference attracted numerous sponsors. “We are very grateful for their support,” Capra said. Sponsors included NJEdge, Blackboard, McGraw Hill, MacMillian Education, Dell EMC, National Association of Community College Teacher Education Programs, and Promethean.